I thought the editing was terrible too. Especially episodes 53-56 hence why fans have done their own edits. Then I didn't like it at episode 55 (I think) when suddenly LCL turn demonic and then suddenly he lost his "power" as I was left scratching my head. I did a timeline somewhere in this forum of what I thought was the correct timeline for the last 3 or 4 episodes, cause they were confusing as heck. The last scene was supposed to be Lu He sword emerging from the Tomb of Swords and Mo Qing calling out “ Zhao Yao” not that repurposed scene of when Zhao Yao and Mo Qing were young. Oh, I hope the editing gets better once again. I have to admit, I get lost sometimes transferring from one epi to a new one. We all quite agree that the editing is very bad. However, I haven't regretted that I decided to watch this. The storytelling (excluding the ending) is good, chemistry is superb (one of the best that I've ever seen), acting is .... (including protagonist and antagonist side characters). I can always create my own ending inside my head, so ..... the re-watching value of this drama is high for me. Now that I more or less have sobered up from frustration of bad ending and editing, I want to talk about the drama ending in general. I think chinese drama has this chronic sickness called "rushed ending". Like 95% drama or more that I have seen always have rushed ending. The only drama that really take time to elaborate their ending (that I know of) is Ten Miles Peach Blossom. That drama really took its time to elaborate Bai Qian pain in losing Ye Hua so when it was time for the couple reunion I could feel the relieve of "Final". I wish that the drama took time to elaborate what had happened in between point 3 and 4. In the point 3, Zhao Yao was in craze moment, trying to find Li Chen Lan remains only to fail. What happened next? Did she return to Wan Lu Men heart broken? Or she refused to return at all? And how did she get this believe that Li Chen Lan would come back? Because she didn't find the body? Well, Li Chen Lan body could have been turned to ash like had happened to Luo Ming Xuan. In her conversation with Sima Rong, I got the feel that Sima Rong was very careful and gentle when he brought up Li Chen Lan issue. I believe any sane person in Wan Lu Men would think that Li Chen Lan was dead, so what had happened that made them never say that aloud in front of Zhao Yao? Bai Lu acting in the end arc was very good. She is the first actress that I have seen that can emote the devastated state of mind that well. Acting for this type of screen is not easy I think because the sadness that must be emoted is beyond tears. The actor/actress needs to emote with their whole body. Bai Lu nailed this very well. You can see in the way she smiled, walked, and talked when she was in that white mourning clothes. I can only imagine how she would act in a screen when she needed to defend her believe that Li Chen Lan was still alive; when the memory of her thrusting Liu He sword through Li Chen Lan body was still very fresh in her mind. That would be one hell of performance if nailed well. The pain, the disbelief, the desperation, and above all anger to herself. Li Chen Lan brought out Liu He sword on his own choice, correct. But at that point of time, it would not matter for Zhao Yao. All she knew, she was the one who asked for the sword, and she was also the one that used the sword to kill him. Her conclusion would be: I was the one who brought him to his death from the beginning. I wrote a short AU story where all the happy WanLu Sect members survived. It’s random and badly written, but hopefully it can help soothe some hearts or give you a smile. Click HERE! Hope I'm not too late to release my very long final comments on The Legends. Zhao Yao, is a name I am very familiar with because I have been there since the birth of the web novel. Like every other live action, I wasn't very confident if it was a depiction that I wanted to watch. You don't come across a female protagonist as fiery and badass as Lu Zhao Yao very often. Thus, if the LZY portrayal here did not suit my taste then with no hesitation I am out. Despite being a new actress, Bailu's acting as LZY has my stamp of approval! It only took 2 scenes in episode 3(?) for me to stan this drama. I got to mail a cookie to this girl! Li Chen Lan wasn't a character that particularly stood out for me while I read the novel. The author gave him great lines and the die-heart-devotion package, but in all honesty there are abundant characters like LCL in the C-novel land. Therefore, to me, it didn't really matter who played this character or how great/bad his acting skill was as LZY is more important. In my opinion, Xukai was an eyecatcher in Legend of Yan Xi and nothing more. So I didn't anticipate I would fall this deep into the Xukai abyss. His acting as LCL/MQ was astonishing and it slowly creeped into my heart. However, like Xukai said his in interview, the range of emotions for this role is limited. How many times was our little MQ happy in this drama? He spent most of time worrying about either himself or about ZY. Additionally, there are 2 other unforgettable scene that I would like to bring up. First, the relic destroying battle in episode 23 and secondly, the last duel between MQ x ZY in the Wan Jun Sword cave of episode 55. These caught my attention since the promotional period. Episode 23/ The CG for this episode was a beast, it blew me away. CG is an inseparable element in 90% of modern or ancient C-dramas. Sometimes they are very noticeable like the 'magic powers' during Wuxia fights, or just simple snow flakes outside the window. Either way, my point is the producers are very stingy when it comes to CG despite the mass usage. Look at the CG in Heavy Sweetness Ash Like Frost, that was cringy and even in Guardian the CG wasn't the greatest. Only a hand full of dramas are willing to sharpen up for this aspect. The storms clouds, the thousands swords, the dragon, the lightning, the demonic hand, the action, the postures, EVERYTHING was exceptionally well seasoned. Thus, I came to the conclusion that Zhao Yao flushed all their budget and effort into this one episode. From this point onwards everything went downhill. Editing errors rapidly accumulated, the screen time between the main and the side characters was terribly planned and distributed, and a large amount of flashback implantations to stall time. Also, have you seen a TV drama with only a 37 minutes in duration? Bloody Hell. Episode 55/ The duel was the lone scene that is worth remembering out of the whole episode. This SHOULD AND COULD HAVE BEEN the brightest highlight of the entire drama. The makeup, the acting, the scenario just everything was exceedingly BEAUTIFUL, yet it was turned into a joke. Don't get me wrong, the duel by itself was extraordinary (including the editing) but every other part before and after it was trash! A bloody disaster! WHY DOES LU ZHAO YAO have the lightning sword stored away in a box container, when it supposed to be in the hands of LMX? WHY IS MQ'S BED SO MAGICAL that it can ignore the existence of space and time? WHY DID LCL DROP TWICE IN THE ABYSS at almost back to back rate? Whether or not it was due the editors wanting transform the original ending to a happier finale to please the audience or because they had to adjust the contents to pass the broadcast committee, the resulting situation leading to and from this epic fight was tarnished. Our actor and actress did such a great job performing their roles but the post-production team demolished their brilliance. Anything else would have been more appropriate than this half dream half illusion circumstance presented. I DONT NOT LIKE IT AT ALL. If the post-production had to forcefully change the contents then at least puts some more effort into it!! DONT RUIN THIS PIECE OF ART! The ending for goodbye princess was heart-wrecking, but it was worth my tears and every second I spend with the drama. If the sad ending for The Legends meant MQ died here and ZY wandered alone for the rest of her life (or whatever other ending) then let it be. It's a sorrowful farewell, but at least I am left with a favourable aftertaste and maybe worth my tears. I will refrain from blaming the writers (drama and novel author that participated) for my disappointment on how the drama was executed for 2 reasons. First, I am a fan of the author 九鹭非香. Second, the original script was more or less lost during the assessment with the broadcast committee and adjustments are also made during the on-set filming. I still remember how impressed I was at the writers' ability to rail the diverging drama plot back to the same track as the novel, or at least the contents were in parallel with each other. Of course, that only happened during the first half of the drama before the new arcs was added. Regardless, my anger remains with the editing team. I am absolutely certain that every film production has to review their product before it aired, right? If the audience can catch an error, then that mistake should have been magnified a hundred times in the eyes of the proof-watchers. Pushing the choppy editing style aside, how many times were there day/night inconsistencies? If there are complications with filming during night time when the moon is actually out on display, then what is wrong with enjoying the sun? "Look the sun is so warm and bright, what pleasant weather" works just as romantic. What is wrong with having the drunken kiss during the daytime? Details would have been more vivid. An easy swap in lines could have saved them some post production work. Although, I am positive 九鹭非香 did not realized the night time effect would be this dreadful. Also, I noticed the script writer is a total CP wrecker. All the male characters were sentenced to death (including LCL if the ending was the sad ver. ), and the female characters were left behind, ALONE. IF they were all married, then there will be 4 widows. The only 2 male characters that successfully escaped this lethal fate was Liu Cang Ling because he remarried married someone else. The other being Si Ma Rong since his lover is already dead. Also, I have a concern about Qin Qian Xin. Is he actually DEAD? Or is this a very roundabout way of saying he has ascended to the heavenly realm as an immortal (mimicking in the novel). The other person that achieved the same divine status was ZY's first husband, Cao Ling(?). The drama didn't DIRECTLY mention the immortal part, instead the direct quote was '我儿子上天了', ‘my son rose to the sky'. So I wonder if QQX's 'death' is just another censorship workaround? Especially when no one pointed out to 17 that QQX was legit deceased. I know this is off topic but whenever I see a character take the form of a butterfly, it reminds of the God in Goblin: the Lonely Guardian. So, while I watched QQX flutter around it made me believe that he is an immortal, not someone that passed away. The Legends is a sad victim of mismatch efforts between on-set-production and post-production. Things would have worked out for the better if post production crew pay more attention to their creation. The Legends was a EXTREMELY rough ride of 56 episodes, I DO NOT love every single moment but I am glad I rode along and I do not regret it (mainly due to the actors). With that being said, I am very much looking forward to the military academy starring BaiLu and Xukai. The same producer that produced Legend of Yan Xi is in charge of this drama (some quality content guaranteed!). YAY!! Now finally, China's very own military version of Hana Kimi. Bonus: The Armpit Stab. As if LCL's head stab wasn't awkward at all. For anyone that is interested in the wallpapers [HERE], most of the ZY's and MQ's stills are posted with imgur links to the full resolution (usually 4k). One of my favourite FMV makers, re-edit the last part of the drama (2hr in length). There is no direct link to the video due to copyrights but he/she posted the baidu drive (like google drive) on weibo. I haven't watched it yet because it is still downloading. (If you are not a 'VIP'/'REG' paid member of the baidu drive then downloading rate for a 3x 2GB zip is a bloody pain). However, judging from the comments it is has BETTER editing than the official drama. Even though, I truly believe fan edits cant heal the damage done and the official drama probably cut out some materials to morph their 'happy ending', I will still send my good luck to anyone who decides to download the file (specifically to the the non-paid baidu users, like me). List of all the BTS I posted + Week 8~10/finale that I might have not posted. DIRECT VIDEO LINK (DOES NOT WORK WITH THE CONVERTERS.. COPY THE WEIBO URL AFTER CLICKING IN). bailu: LCL I DIDNT KNOW YOU ARE THIS TYPE OF PERSON! Si Ma rong: Who would you choose? Thank Bailu & Xukai for ten weeks worth of companion! @xienrue @DontEatMyKimchi Totally agree with you guys. I think they couldn’t elaborate more on your point 3 and 4, @xienrue is because the writer didn’t have enough time to write a detailed in between scenes. As a matter of fact, I felt that each of the scenes/main events we have in the last 3-4ep were like key screens, that needs other scenes to flesh out the storyline. Again, boil down to time and budget. 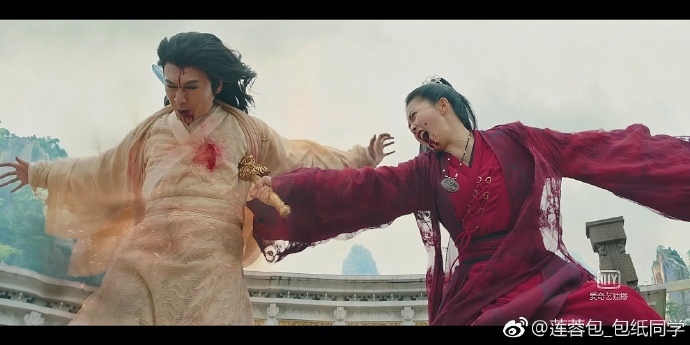 I agree that the cgi on that battle scene you mentioned were the best, @DontEatMyKimchi I was surprised too, and think the CGI of this drama was far better than a lot of other cdrama out there. I know the quality degrade afterward, but all drama has bad cgi, so taking that as standard, that one scene make this drama trump the rest, if that makes any sense lol! Drama's Weibo is still active. I hope they will continue to upload the BTS videos until the military drama airs. LOL. Sorry, I cant open the link.. not sure why. perhaps i am not baidu registered user. is there another way to watch this? THanks. Here's a recap of the last 2 episodes.